Blue sage (Salvia azurea var. grandiflora) of the Mint (Lamiaceae) family is a long lived herbaceous perennial with sky-blue flowers. Variety grandiflora occurs throughout a large portion of the central U.S. stretching from Utah to Ohio, and from South Dakota and Michigan to New Mexico and Alabama. The typic variety, var. azurea, occurs farther to the southeast from Mississippi to Florida to North Carolina. In Arkansas, var. grandiflora occurs throughout the Highlands that compose the Ozark Plateaus, Arkansas Valley and Ouachita Mountains, as well as in higher elevations of the West Gulf Coastal Plain. Blue sage is primarily found in well-drained, dry to mesic, and sandy to rocky soils of sunny prairies, open woodlands, roadsides and glades. Salvia, meaning “healer”, is the old Latin name for sage, based on some plants of the genus having possible medicinal properties. The specific epithet refers to its blue flower color. Other common names include Pitcher* blue sage and wild blue salvia. Plants have long, slender and sturdy upright to leaning stems that reach 2 to 5 feet tall. The number of stems increases over the years so that rough, knobby, compact clumps form with a multitude of long, tough and slender, radiating to deeply bedded roots. Early stems have short dense pubescence, but this pubescence may be worn away as the season progresses. Branches, most numerous in the upper portion of plants, grow singly from axils of opposite leaves. Although length of branches varies, in general, lower branches may be 14 inches long with length gradually decreasing toward the plant apex, where lengths may be less than an inch. Long branches may have secondary branches. Plants are drought tolerant; however, leaves wilt during hot dry periods, and flower development is interrupted. Stems and branches are four-sided with broadly rounded corners made prominent by deep central grooves along the faces. Stems have a purplish cast in spring, change to medium green in summer and become yellowish in fall with lower stems changing to brown, as the epidermis splits with growth and stems become rounded. Woody dead stems persist into the next growing year. Photo 1: In mid-April, purplish stems are densely pubescent. Growth scars encircle stems and branches at base of petioles so that stems and branches are uniformly divided into 1 to 2-inch segments. Segment length remains fairly uniform all along stems and branches while stem diameter decreases slightly at upper ends of segments. Growth scars, which are purplish in mid-season, become brown in fall. Photo 2: In mid-May, this leafy multi-stemmed plant has not yet attained a height where stems branch. Growth scars, around stems at petiole bases, are purplish. Cauline leaves (there are no basal leaves) grow from grooves along opposite flat sides of stem, with leaf pairs rotated 90 degrees from pair to pair. While lower leaves may be four inches or more long and ¾ inch wide, upper stem leaves below the inflorescence may be an inch or less long and ⅛ inch wide. Leaves within the inflorescence become increasingly smaller to tiny and bract-like and tend to drop off in dry periods as flowering continues. Leaves are linear-lanceolate with very gentle tapers to blunt-tipped apexes and wedge-shaped (cuneate) bases. The taper to the leaf base is so gentle that separation of leaf blade from its short petiole is not especially discernable. Leaves have widely-spaced, shallow serrations which are clearly seen on large leaves but become obscure to absent on smaller leaves. Upper leaf surface is a medium grayish-green with a slight gloss while the lower surface is the same color with lower gloss and a lighter colored, raised midrib. Leaf blades, in-folded along midveins, feel coarse. Crushed leaves have a light, non-minty scent. Later in the growing season and especially when soils dry in hot weather, lower leaves drop off. Inflorescences consist of terminal spikes on main stems and axillary branches, regardless of length. Flowers occur in paired opposite clusters of two to twelve tightly packed flowers on 1/16-inch weak pedicels. Larger paired clusters appear to be whorled about stem (false whorls or verticillasters). Lower paired clusters may be an inch or more from each other, but up-spike separation may decrease to the extent that the upper portion of spikes appear to be “solid” with flowers, although separation is still present. Although flowering occurs generally from lower to upper portions of floral spikes, flowers within a cluster mature at varying times so that total bloom period may extend from mid-summer to mid-fall as spike tips continue to grow. Flowers are larger at first-bloom while temperatures are cooler and soil moisture remains uniform. Flowers, ½ to 1 inch long, have mostly sky-blue corollas each with an upper and lower lip (bilabiate). A large, fan-shaped and glabrous (hairless) lower lip has a v-shaped notch in its central outer margin and a long tight slit in its side margins resulting in four lobes; two large lobes in front and two considerably smaller proximal lobes. Upper and lower lips join to form a narrow throat that extends into a gray-green tubular calyx covered with short pubescence. The entrance to throat (and nectar) is tight. The softly pubescent upper lip is rolled into an upright, elongate, rounded, hump-backed and close-topped ¼-inch tube that has an imperceptible slit along its length, facing the flower center. The floral throat and central portion of the lower lip are smudged or streaked with white; the lower side of the lower lip is mostly whitish. The calyx, about ¼ length of corolla, has three triangular points, with an upper broader point at the top of calyx and the other two points along the calyx’s sides. The calyx, with weak longitudinal ridges, is flattened from top to bottom with a corresponding flattening of the floral throat. Photo 3: First flowers blooming in early September. Note that opposite clusters of flowers are subtended by small, linear, leaf-like bracts. Also note ridged calyxes. Photo 4: In late September, plants appear straggly. Many calyxes are gaping open after flowers have faded and nutlets are being dispersed. Flowers of blue sage, with only two anther-bearing stamens, have a unique, elaborate architecture that helps ensure efficient deposit of pollen onto pollinators. Side-by-side stamens extend into the throat and upper, hooded lip of the corolla. In most flowers, and even in most mints, an anther (typically at the tip of a stamen) comprises two half-anthers (each with pollen sacs) that are closely adjacent to each other, with a thin strip of tissue between them called the connective. In blue sage, and in many other species of Salvia, that connective expands into two arms, pushing apart the two half-anthers: A fertile (pollen-bearing) half-anther is projected forward and lodged under the hood of the upper lip, while a sterile half-anther (the half-anther itself is actually so reduced that only the connective remains–see photo 5) is projected back into the throat of the corolla tube. This bizarre anther (and there are two of them in each flower) with its aberrant connective is delicately hinged onto the tip of the staminal filament and becomes a kind of see-saw. When a large bee enters the throat of a flower in search of nectar at the base of the corolla tube, the bee’s head pushes up against the two sterile connectives, causing the two fertile half-anthers to see-saw down and deposit pollen on the top of the bee’s head or thorax. A blue sage flower’s pistil, too, is designed for pollination by large bees. The stigma becomes receptive after the flower has shed its own pollen (greatly reducing self-pollination and promoting cross-pollination). The style extends into the corolla’s upper lip, slightly past the anthers, where it is divided into two stigma lobes: a longer thinner fish-hook-shaped portion and a shorter stouter prong-shaped portion. The fish-hook portion is angled toward the back of the upper lip while the prong portion is exserted through the slit of the hooded upper lip. With this disposition, the stigma is well positioned to intercept pollen from the bee’s head and thorax. Photo 5: Two complete flowers (#1 [upside down] and #2 [right-side up, and showing hooded upper lip nicely) and a divided flower (#3 to #8): upper hooded lip (#3), stamen pair (#4 [fertile half-anthers are to the left, sterile half-anthers to the right]), unequally divided style (#5), lower fan-shaped lip (#6), lobed ovary (#7), calyx (#8), and nutlets (#9). Photo 6: Display showing lower lip of a flower with stamen pair (on left) and see-saw structure of a stamen pair with divided style (on right). Note that (on right) pollen is present on “concave” anthers, but divided stigma is not yet fully developed. Photo 7: While this bumble bee (Bombus bimaculatus) gathers nectar, the prong portion of the stigma takes pollen from its head while the thinner portion extends outward at tip of hooded upper lip. Note unequal portions of divided stigma and pollen mass collected by bee. A fertilized ovary may produce several 1-seeded nutlets. Nutlets mature quickly after fertilization and may drop from calyxes while calyxes are still green. The ⅛-long nutlets are light tan with a rough exterior. When established in a garden or naturalized area, blue sage reliably returns year after year. Its straggly appearance at maturity can be improved by removing half of its upper growth in late spring. Plants need consistent moisture to look their best, but a wilted plant will renew flowering when conditions improve. Removal of winter-dead stems improves plants’ appearance in spring. 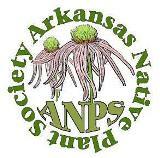 Other native species of the genus that occur in Arkansas are: lyre-leaf sage or cancer-weed (Salvia lyrata) and lance-leaf sage (Salvia reflexa). Lyre-leaf sage, occurring statewide, is a short perennial with blue flowers and deeply cut basal leaves. Lance-leaf sage, reported from a couple of northern counties, is an annual with overall characteristics similar to blue sage, except plants are shorter, leaves wider, flowers smaller and ridges on calyxes more prominent. Non-native scarlet sage (Salvia coccinea), reported from Pulaski County, has heart-shaped leaves and scarlet flowers. Named for Zina Pitcher, a 19th-century doctor and amateur botanist. This entry was posted in Know Your Natives, Native Plants, Wildflowers and tagged Blue Sage, Know Your Natives, Lamiaceae, Salvia, Salvia azurea. Bookmark the permalink.